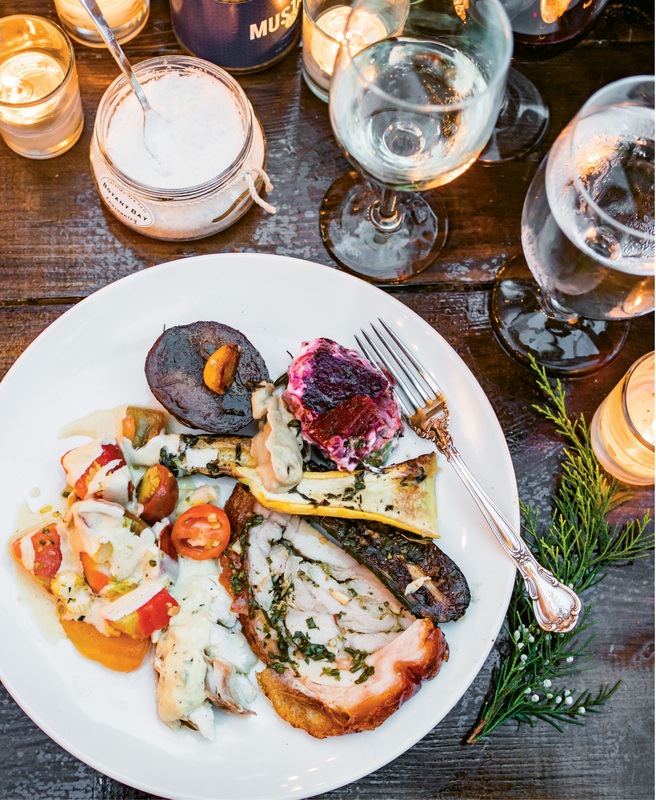 A plateful of fire-roasted delights, including porchetta, snapper, and veggies, is complemented by a cool heirloom tomato salad. Arrive via the Barrier Island Eco Tours ferry. 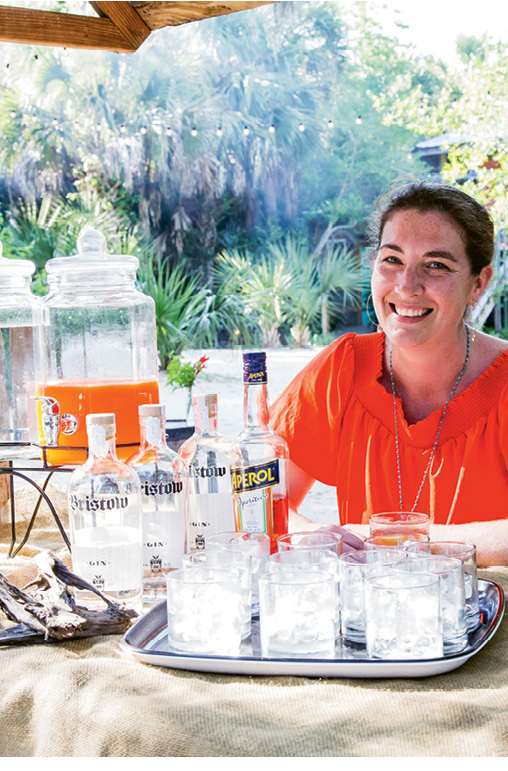 Colleen Deihl whips up her signature twist on the Negroni. 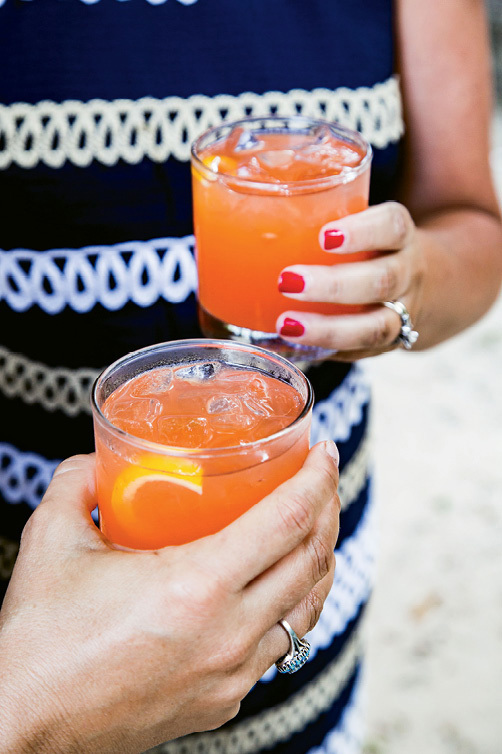 A colorful toast to a great evening. 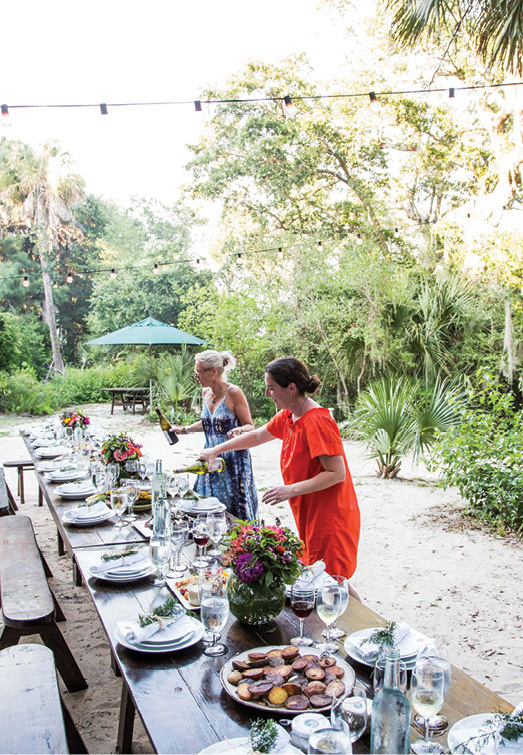 Colleen and Helena Fox Fraser set the table. 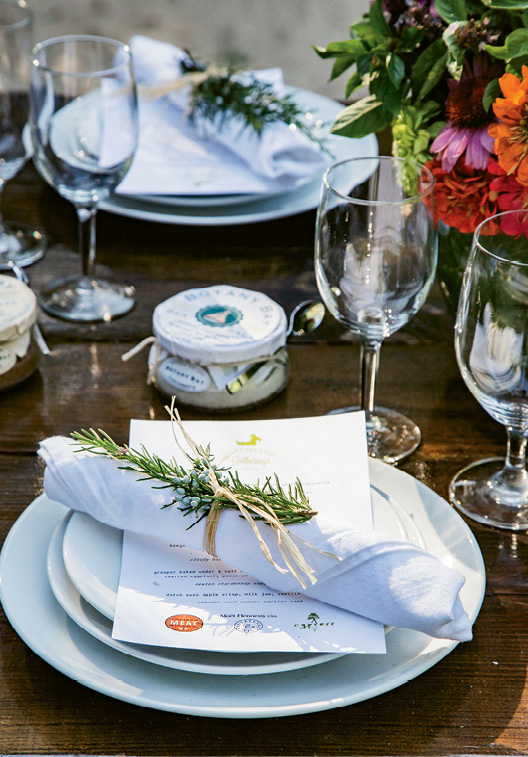 Settings are accented with sprigs of juniper from a nearby tree. Deihl’s fire pit in action. 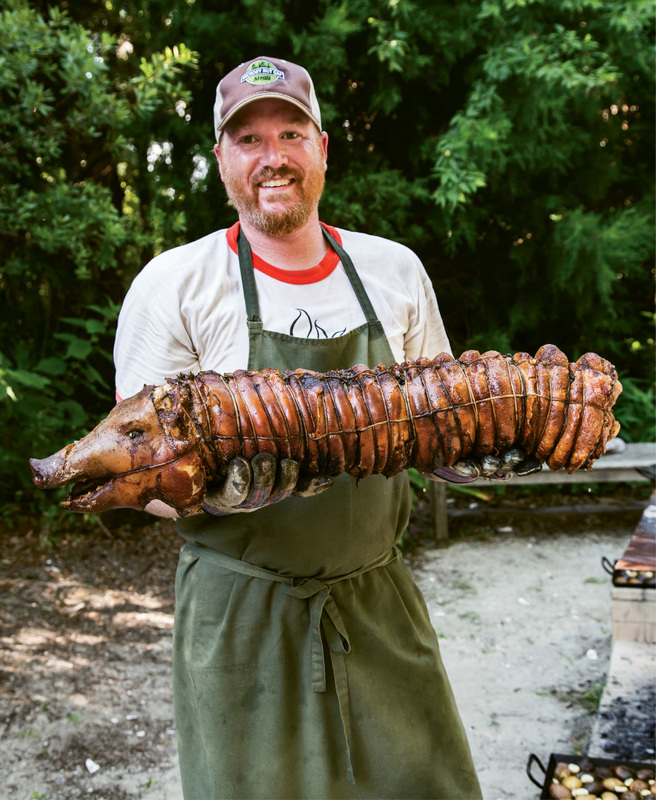 The porchetta whisperer himself, Craig Deihl. 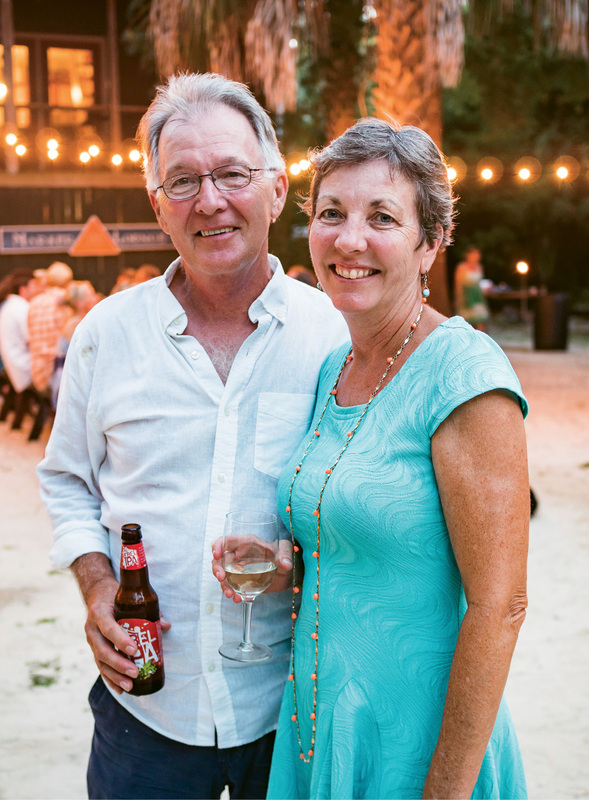 Guests sip and sway to the upbeat harmonies of Cane Creek String Band. 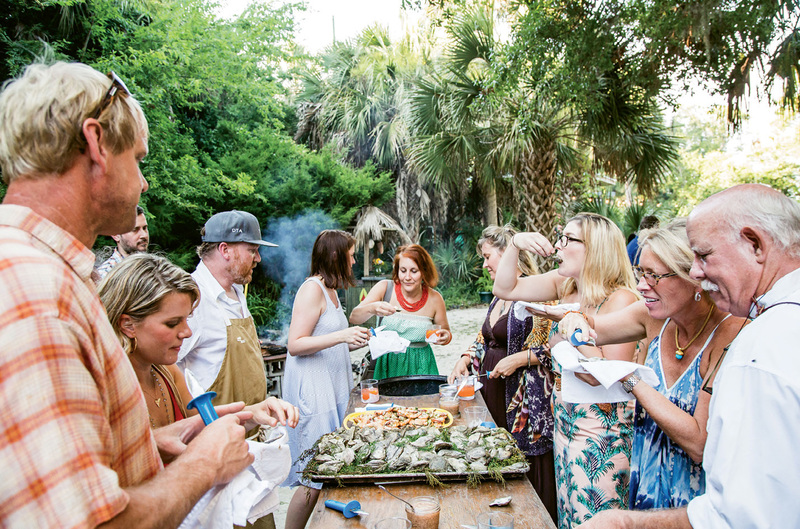 Guests peel shrimp and pry open juniper-roasted oysters only moments after Deihl pulls them from the fire pit. An evening breeze rustles the nearby juniper tree from which the garnishing sprigs were clipped. 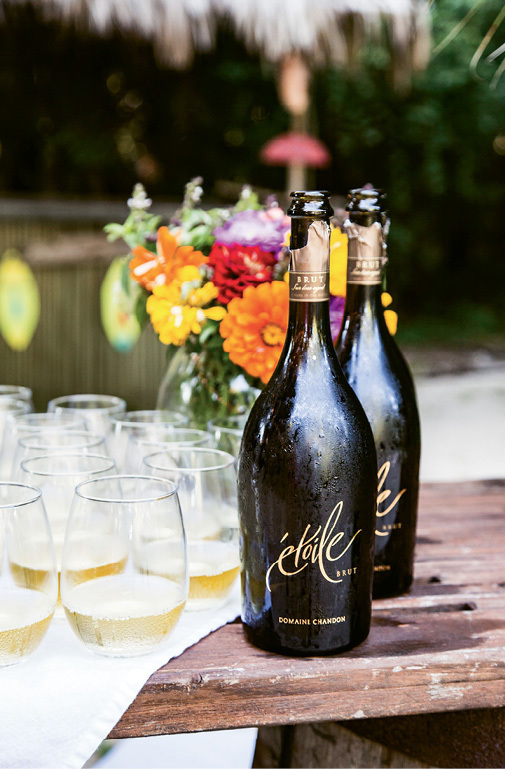 Chandon Étoile bubbly launches the feast. Roasted oysters with a hint of juniper. 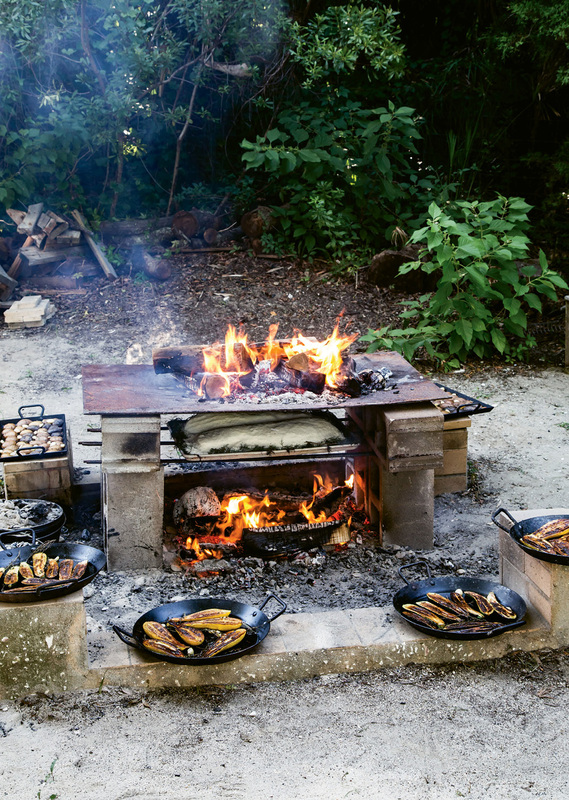 The chef in his element, no stranger to fire. Deihl shows off his juicy porchetta. 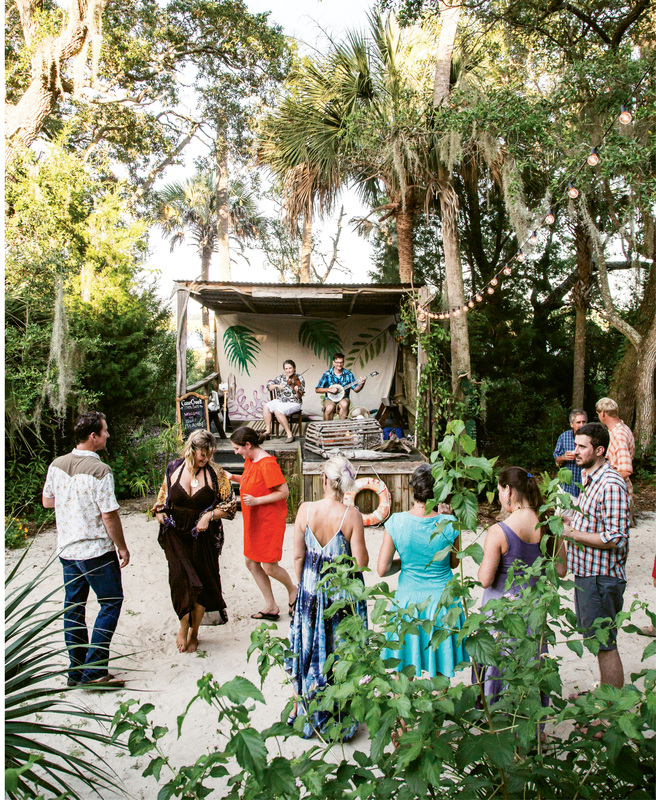 Past overturned canoes and a hammock strung beneath palmettos, the path opens to a wide clearing where Deihl’s wife, Colleen, offers refreshing gin cocktails she’s dubbed the “Goat Negroni.” The resonating melodies of Cane Creek String Band—whose fiddle player, Bertha Booker, made the sea salts that will grace our table—set a festive mood. But the real star of the evening is Deihl himself, busy tending to his multi-level, self-constructed fire pit of cinder block, rebar, and smoldering coals. Guests wander over to marvel at the action and to drool over dishes to come. Potatoes sizzle alongside whole garlic cloves and rosemary sprigs. 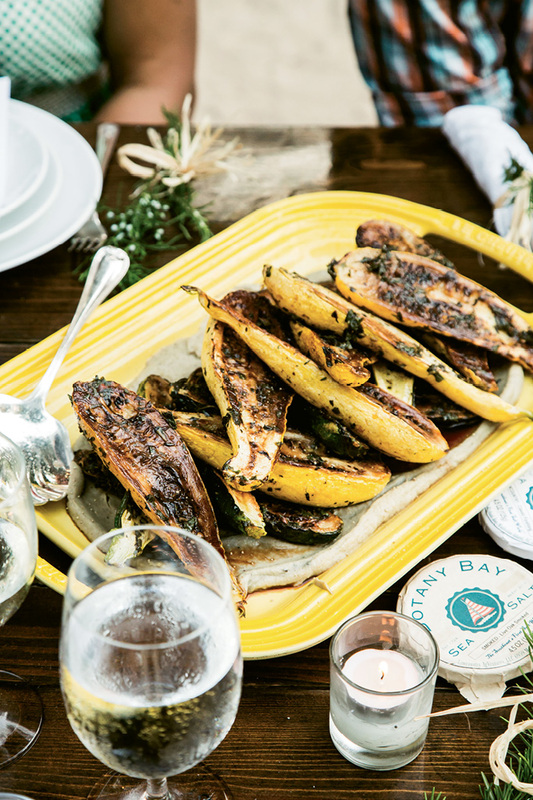 Likewise, squash and zucchini bathe in crackling olive oil, as beets roast to a charcoal black, their interiors still blood-red and juicy. 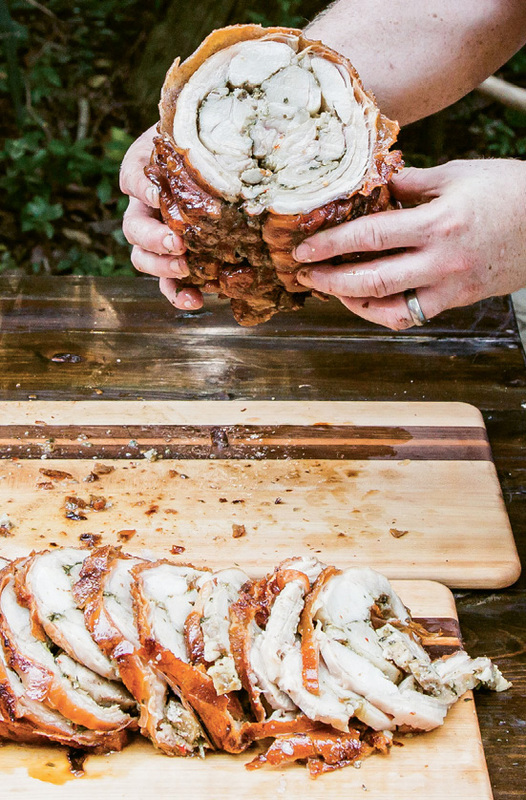 A wire-tied pig floats above smoking embers, its body reconfigured into the elongated spiral of Deihl’s signature porchetta, with skin crisping to perfection. 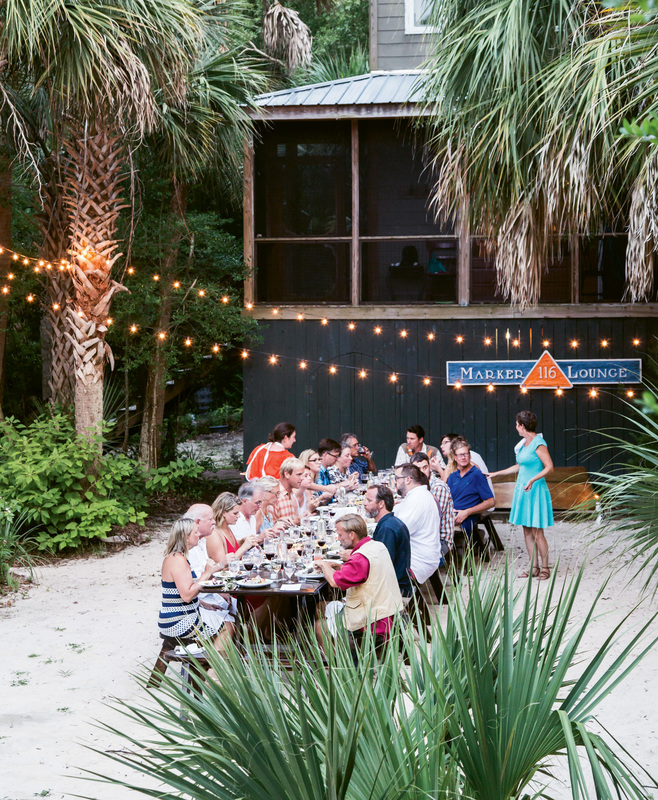 Goat Island feels worlds away from the chef’s downtown fine-dining venue, Cypress, and his charcuterie mecca, Artisan Meat Share. Yet he seems very much in his element here. Deihl industriously stokes coals and shovels them both underneath and above closed pots containing the Dutch oven apple crisp that will grace our dessert plates. He hand-packs a local snapper in a casing of snow-like salt mixed with egg whites to form a sort of “clay pot” encasement to bake in the heart of the pit. 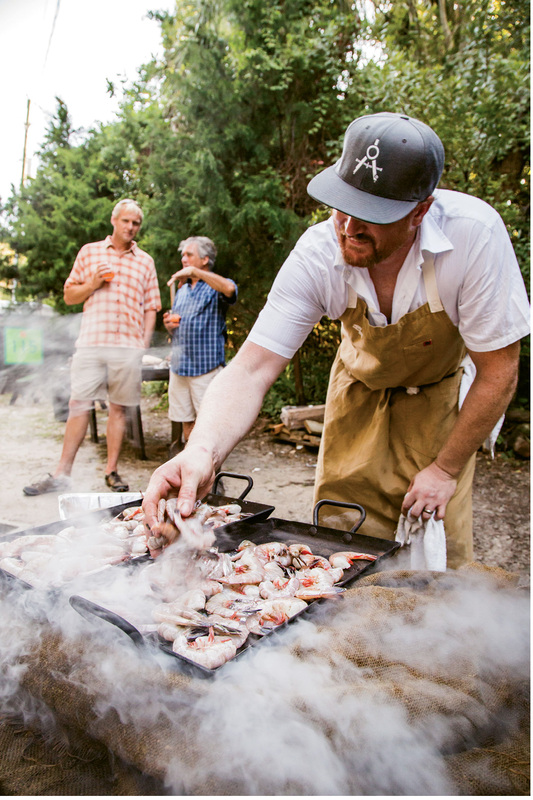 His hands bear the battle scars of a culinary juggler who deftly raises, lowers, and shakes myriad hot and heavily laden cast-iron vessels, his timing always just right, his fingers often directly in the flames. It was on this very island that Deihl married Colleen 11 years ago. The place belongs to her parents, Dennis and Diann Clark, who bought property here in the 1980s after one too many Pennsylvania winters. Colleen’s younger brothers grew up on Goat Island playing in tree houses amongst the palms, but since all of the children have now grown and flown, the Clarks offer their property for special events under the title “Goat Island Gatherings.” It’s an enviable retreat, only a few minutes boat ride from civilization as we know it, yet as remote in spirit as Gilligan’s Island. While Deihl preps the meal, I steal away to explore. A path leads back across the island’s main “road” (a dirt path strewn with fallen palm fronds that locals call the “Leisure Trail”). I am not alone: The scurrying sound of hundreds of fiddler crabs fleeing my every footstep keeps me on my toes. 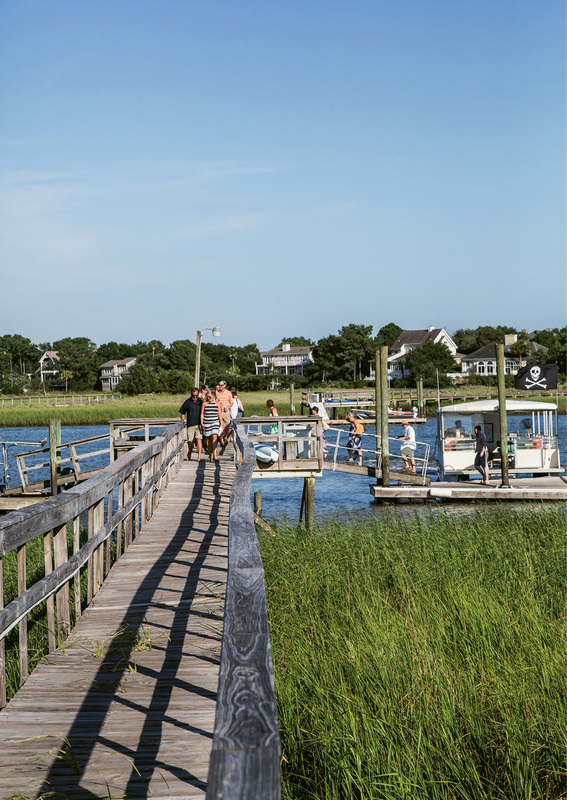 A long pier stretches far into the marsh on the backside of the island. A few white egrets scavenge the pluff mud for treats. I realize why Goat Island’s dozen-or-so “full-timers” have fought off all proposed bridges. There is a stillness here, the vestiges of a wilder barrier island existence that begs to endure. I return to find Deihl roasting oysters under a moist burlap sack. He lifts the cloth to reveal jagged clusters nestled into aromatic juniper branches. 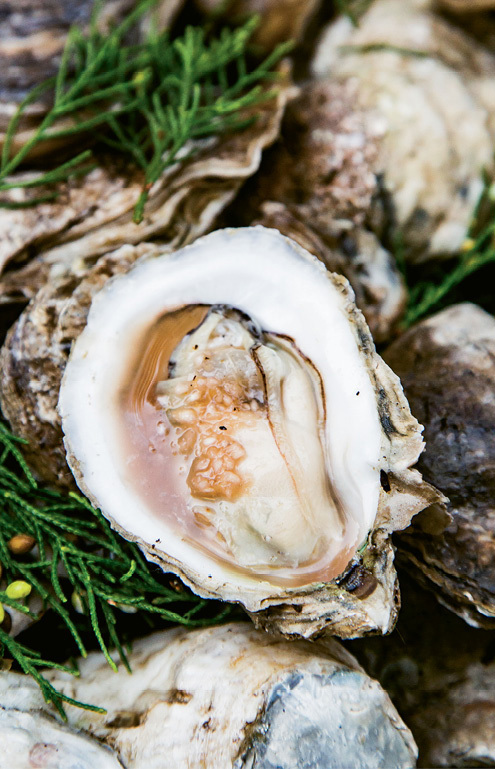 We dig into the oysters, discerning their lightly piney and peppery notes, as the breeze rustles the very tree from which the juniper was harvested. 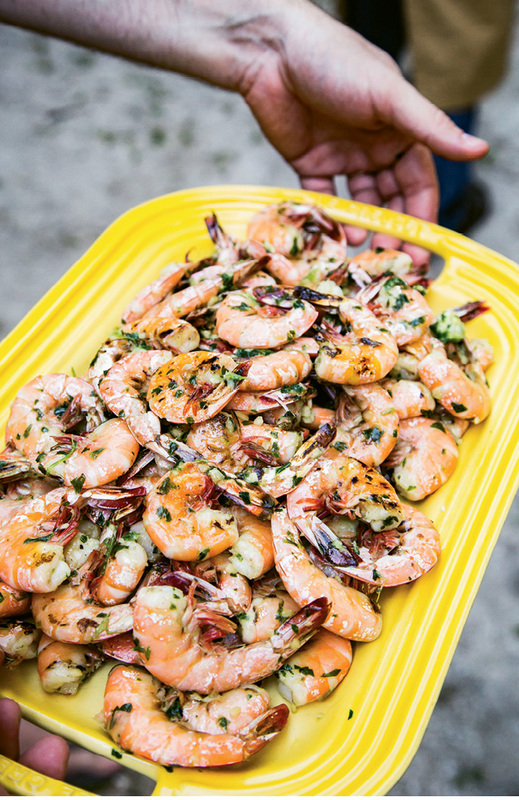 Next up for the stand-and-snack hors d’oeuvres is the peel-and-eat shrimp, freshly smoked in the charcoal pit and slathered with lemony garlic butter. 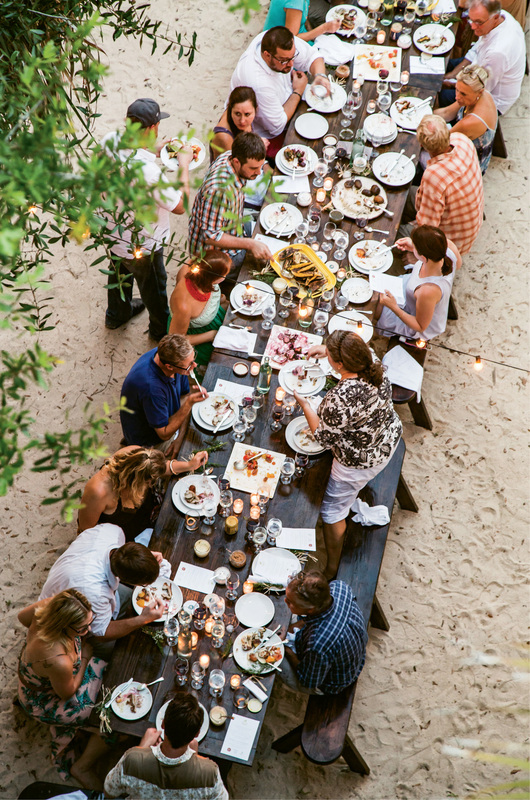 Sitting down to dine with glasses of bubbly, followed by wines curated to complement each dish, we wiggle our toes in the sand as we feast and imagine that Thurston Howell III would have been thrilled to be stranded permanently on this island. Alas, for the rest of us, the fabulous dinner comes to an end, and we are ferried back to our waiting cars, hoping to one day receive another such invitation to this idyllic retreat.